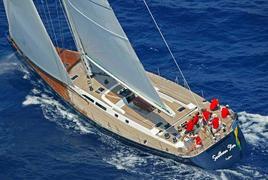 The 23.95m sailing yacht Southern Star won the coveted Southern Wind Cup at last week's Loro Piana Superyacht Regatta and finished fifth overall after several heady days of racing, which gives me the opportunity to plug the fact that she's currently for sale. Southern Star was built by Southern Wind Shipyard in 2004 to a Reichel-Pugh design. Her interior, by Nauta Design, accommodates six guests in a master and two twin cabins and, with a cruising speed of 10 knots, this superyacht has a range of 1,600 nautical miles. On the market with Pegaso-Southern Wind and with a pedigree considerably boosted by this win, she's asking €3.25 million.